Magic Keyboard with Numeric Keypad - You get all the functionality of Magic Keyboard, with an extended layout that makes it even easier to work and play. The new Magic Keyboard with Numeric Keypad includes document navigation controls — page up, page down, home, and end — and full-size arrow keys that are perfect for navigating pro apps, moving through spreadsheets, and playing games. 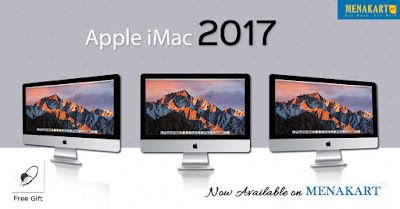 macOS Sierra - macOS is the operating system that powers everything you do on a Mac. macOS Sierra introduces Siri to Mac3 — along with more ways to enjoy your photos, shop securely online, and work seamlessly between devices.